The skill of “spontaneity” is increasingly becoming important because of the increased level of competition among the organizations. 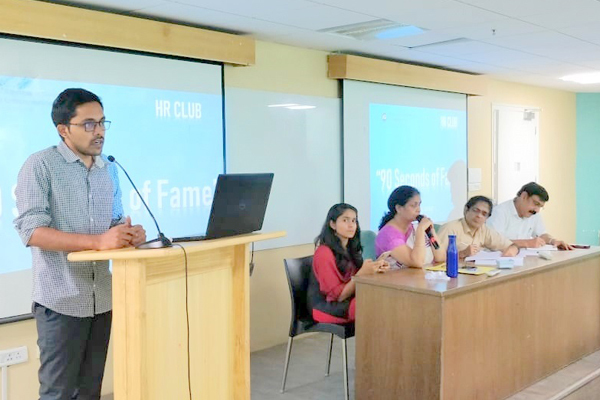 Keeping this aspect in mind MATS Institute of Management and Entrepreneurship (MIME)’s HR club organized an extempore speech competition entitled “90 Seconds of Fame” for PGDM Students. This extempore competition was held with respect to the changing trends in HR and giving a better insight into the emerging trends and challenges that are appropriate to an industry. The topics included Internal Recruitment, Restructuring, Total Quality Management, Work-Life Balance, Critical Incident Method, HR Planning, HR Information Systems, Core Competencies, Job Rotation, On the Job Training, Exit Interviews and Performance Appraisal. Out of 38 students, 25 students were short-listed for the final competition wherein each participating student was given 90 seconds to talk on a randomly picked topic. The students were judged based on the four criteria of content, communication, body language and time management.